Well, let’s just say that some on the Bonnies Bandwagon message board did not take too kindly to those remarks. Admittedly, I did a minimal amount of research on St. Bonaventure before the season, and posted the blurb below about them in an analysis of the MSU basketball schedule. Winning in a hostile environment – No, it’s not exactly like going on the road in the SEC, but 5,111 fans packed into the 5,780 capacity Reilly Center can feel just as hostile and just as loud as a much larger crowd, if not more because of the closeness of the environment. Pulling through, even after failing the seal the deal the first time – At the 9:31 mark, Jarvis Varnado got a dunk, And 1, to put the Dawgs up 63-48. Over the next 3+ minutes, the Bonnies would go on an 13-4 run, assisted by three Dee Bost turnovers, who was playing with a sprained ankle that occurred in the 1st half, to put the score at 67-61 Bulldogs with 6:12 left. The Bonnies would continue to claw their way back, tying the game at 71 with 1:52 left. For the rest of the game, the Bulldogs would not allow St. Bonaventure to score. One can be justifiably disappointed that the Bulldogs could not put the Bonnies away, but be happy that this young team came through when it mattered most. 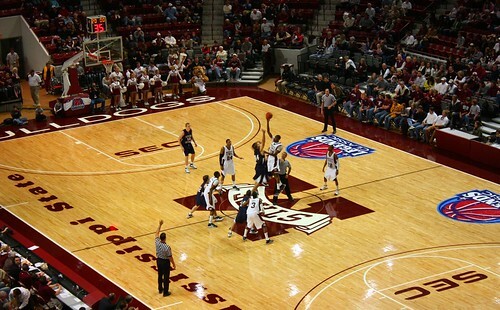 Ravern Johnson, rising star – Johnson was second on the team in scoring with 18 points and also pulled down seven rebounds. But Johnson is a rising star because in the final 22 seconds, he grabbed an offensive rebound, hit a big 2-pointer, snatched a defensive rebound, and sealed the game by making two free-throws with one second on the clock…..ice water may be in the kid’s veins. Jarvis Varnado can score – Big players provide big stat lines, and they don’t come much bigger than 19 points, 12 rebounds, and 6 blocks from Varnado. The Bulldogs will play Washington State on Friday at 5:30 pm eastern time in the Legends Classic. Unfortunately, right now it looks like Dee Bost is “very questionable” to play in the game. Beckham stepped up when Bost hurt his ankle the other night, hope he is ready for round two. Following the bad recruiting news….. In state product, Shaunessy Smith, has made good on his verbal commitment to Mississippi State and signed binding scholarship papers to play for the Bulldogs on Wednesday. Rick Stansbury’s recruiting prowess beat out the likes of Clemson, Baylor, and Southern Cal for the services of Smith. Well….not so fast my friend. Former Bulldog basketballer, T.J. “Brown” Billups, is Shaunessy’s coach at Noxubee County. Former Bulldog great (coach and player), Greg Carter, already let Travis Outlaw get away to the NBA (Carter coached Outlaw at Starkville High). I would have had to let T.J. know if he let Shaunessy get away from playing at The Hump. Just kidding, T.J. and I go back from our college days. He was one of the nicest guys to ever pick up a basketball for the Bulldogs. You can read more on Shaunessy in a previous Bulldog Maroon & White post, MSU Bulldog Basketball Gets A Commit From Shaunessy Smith. Ok….I digress. Yesterday, on a post I had about Rhodes being absent from the NBDL draft list, someone (with a Latvian-based email address) left a comment that Rhodes had signed with Barons LMT, a team based in Riga, Latvia. Searches and Google translates of the team site yesterday did not yield any results. However, today, several sites are reporting that Rhodes signing with Barons is very close to happening, if not already official. You could get the Spanish translation of this report on BasketCentral.it, but the two sentences it contains basically say that an official announcement of Rhodes signing with Barons could come within hours (the report came across the wires around 8:40 am est time). This Lithuanian site is also posting videos of Rhodes at Mississippi State, in addition to reporting the signing. Of course, the best bet for the latest word would probably be the official team site, www.barons.lv. This release on the Barons LMT site indicates that the team is bringing in three Americans: Corey Smith, Todd Abernethy (former Ole Miss Rebel), and Charles Rhodes. You can go to Google Translate and get the Latvian translation, but the gist is that Rhodes is the only American who has signed a “treaty” (the other two have been invited on a probational basis), but Charles is still waiting for official clearance (whether it be passing a physical or passport issues, I’m not sure). Rhodes’ contract does stipulate that the team can rescind the contract should Rhodes’ performance be “unsatisfactory.” Of course, we all know that won’t happen. Check back with Bulldog Maroon & White for more information on the excursions of Charles Rhodes in Latvia, the heart of the Baltics. After Charles Rhodes was cut by the Dallas Mavericks, I assumed he might make himself eligible for the November 7th NBDL draft, also factoring into my assumption that most European leagues had already begun season play. However, Ridiculous Upside posted the final list for tonight’s NBDL draft and Rhodes is nowhere to be found. Interesting. I did some brief web searching to see if I could find the 411 on C-Rhodes, but all I came up with was a 40-year old Charles Rhodes who was arrested in Lake County, FL for running a meth lab, another Charles Rhodes who won some sort of local election somewhere, and yet another Charles Rhodes who plays college basketball for the Chowan Hawks. To become eligible for the D-League draft, a player must contact the league office, and sign a general player contract with the league. The league determines if the player receives an A, B, or C level contract. Every team is only allowed a select number of A and B players, so they must use those spots wisely. D-League salaries have increased slightly this year. The C contract will be worth $15,000 this season, up from $12,000 last season. The B level contract pays $20,000 this season (up from 18k), and the A contract will be worth $25,000 (up from 24k). These contracts become voided if a team gets a call-up from an NBA team, but are signed for one year otherwise. If a D-League player wants to leave for Europe, they must first arrange a buyout for their contract. The buyout is $30,000.00 from December 31st to the end of the Season in April 2008, $15,000.00 if you get out the contract before the Draft on November 1, 2007, and $20,000.00 from November 2, 2007 to December 30, 2007. As you can see by the dates, this info is actually from November 2007, prior to last year’s NBDL season, but I don’t think the fact that D-League contracts don’t pay much has changed. And that’s the Catch-22 faced by a lot of players. Do you play in the confines of your home country, and closer to an NBA call-up? Or do you head overseas to a foreign league that pays much more (such as those in Italy, Spain, Russia, and Greece)? TCOB….“Taking Care of Business”….that’s what the Mississippi State Bulldogs did in their opening exhibition match against the DII Montevallo Falcons. In 2007, the Falcons were champions of the Gulf South Conference, and made it to the DII Elite Eight. On Saturday, the Bulldogs held the Falcons to 32.4% shooting en route to an 88-59 win. The Bulldog offense started out slow shooting 36.1% in the first half, and ideally, you’d like MSU to put up more than 88 points against a DII opponent……but all that’s okay. With a mix of fresh faces, and a new PG trying to get acclimated to running the offense, the development won’t be instant gratification. Speaking of that point guard, Dee Bost couldn’t find the range from outside, going 1-5 from deep, but I’d much rather see that 7 assists to only 3 turnovers in his stat line. Bost played a team high 32 minutes. Ravern Johnson led the Dawgs in scoring with 19, and took the most shots, 14 attempts, making 8. It’s looking more and more like he will be the safe bet to be Mississippi State’s leading scorer this year. Barry Stewart filled up the stat sheet in good ways (10 points, 4 assists, 5 rebounds, a block and a steal), and bad (3 turnovers, 4 fouls). I believe that if Barry Stewart accepts the role of Robin to Ravern Johnson’s Batman, the two will form one of the more dangerous scoring duos in the SEC. I hope to see Stewart hitting a lot of spot up jumpers created by Bost and Johnson. Jarvis Varnado had a very strong game — 17 points (7-9 shooting), 12 boards, 8 blocks, 4 assists, 1 turnover — those last two categories being the most remarkable. Perhaps freshman big man, Romero Osby, was just as impressive with a double-double (10 points, 11 rebounds) in only 13 minutes on the court. 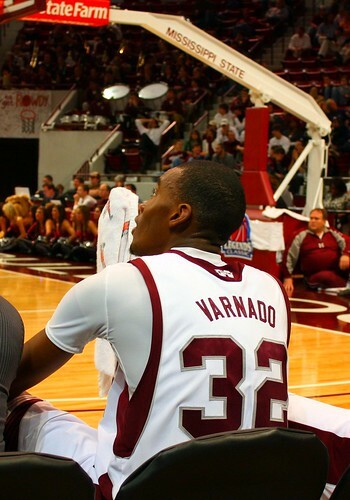 In other words, Varnado is not like Robert Jackson….or Mario Austin….or Lawrence Roberts….or Charles Rhodes. Nothing against those guys, but a big man more willing to pass is refreshing. For other thoughts, check out the comment section on this post at bullybasketball.blogspot. Next up: Exhibition #2 against Oklahoma City in Starkville on Saturday, November 8th. Does Rick Stansbury have a shot at Keith “Tiny” Gallon? It’s well known that the Mississippi State Bulldogs are on the radar of Keith “Tiny” Gallon. It should be made clear that the “Tiny” part is ironic, but not the “Gallon,” as this 6’9″ center prospect, ranked 21st overall (3rd among centers) by ESPN.com/Scouts Inc., weighs in at around 300 pounds. In his assessment of superlatives among high school big men, Scout Inc.’s Bob Gibbons admits that Gallon is one of only three centers ranking in the overall top 25, but does not rank Gallon within the top three in areas such as rebounding, shot blocking, low-post scoring, and high-post scoring. Other profiles on Gallon, such as the one on Draft Express, continue to relay the message that the kid is out of shape. But go check some YouTube videos of Gallon, and he is clearly abnormally agile for a guy his size. What the big man can do with a ball is almost unprecedented…..even for his common comparison, Robert “Tractor” Traylor. So what gives? Well, obviously the AAU/High School system is less about developing and teaching players and more about ‘what can I do for myself lately?’ on all levels. The question is, if Rick Stansbury gets Gallon to Starkville, can he prod the big man into living up to his potential? Stansbury isn’t exactly known for being able to motivate those who lack the full desire to be motivated…..just ask Robert Jackson and Marcus Campbell. Stansbury expects his players to be self-motivated. Not all coaches do it the same way, that’s just Stansbury’s style. Now, it might behoove him to be more like, say, Roy Williams, but with the difficult work it takes to produce a winner at Mississippi State, I can’t exactly blame Stansbury for not taking the time to be a hand-holding nurturer. Right now, the latest reports indicate that the Bulldogs, California, and Oklahoma are at the top of Gallon’s list, with Arizona, Arkansas, Texas A&M, Tennessee, and Georgetown being somewhat in the picture. I’ve heard rumors that Stansbury is losing out on Gallon, but I wouldn’t count Slick Rick out of a recruiting battle, ever. At this point, even Gallon’s coach is unsure about his decision. Will “Tiny” one day squeeze into maroon & white? Stay tuned…..